Your wedding day is a huge event, one of the biggest moments in your life (apart from having children, your graduation, and a few birthday milestones). As a bride, you’ve wanted this day for awhile during your relationship and now you’ve arranged all the details, the location, the wedding party, the reception details…and you’ve especially picked out perfect wedding dress. There’s just one potential issue with your dream dress: Keeping it clean throughout the day. You may only be wearing it once, but it’s important to remember that a wedding dress is something that you’ll want to preserve. There’s a chance you’ll pass it down to your daughter or someone in your family. There’s also a chance you’ll want to recreate the ceremony. Whatever the reason is, most brides like the idea of keeping their dress. In order to do so, the beginning of preservation is keeping a clean wedding dress. In order to have a clean wedding dress, you’ll have to have one by the end of your wedding day and that can be a challenge! 1. Use a sheet: Most wedding parties take photos outside. But as you know the grass, dirt, and even pavement can be filthy. Using a sheet is the easiest (also really cheap) way to keep the bottom of the dress clean. The bride can even have a waiting area on the sheet, while the photographer is taking shots of the wedding party. But remember to bring a sheet to put under your dress, make sure it matches the color of the dress. Most times photographers can hide the extra bits of the sheet slightly under the dress, without it being obvious that you’re standing on a sheet. 2. Bridesmaids: Whether you’re using a sheet or not, you’ll still need help keeping the dress clean as you move around outside. It may seem like a demanding task for them but technically part of the duty of a bridesmaid is to tend to the bride, and this is another way they can help you. 3. Mind the Flowers: Flowers are a major hazard and not just the flowers outside, which you can brush against easily, but even the bouquet itself can cause problems. Usually a bouquet is kept fresh in water. This means the stems are dripping wet. Make sure to dry the stems after taking them from the vase. Be extremely careful when it comes to the bouquet in general. It’s easy to want to hold the bouquet closely and tightly but remember to keep it a comfortable distance away when you’re walking down the aisle or when you’re standing at the altar. Of course we want you to have fun! There’s no sense in you standing around in the corner, afraid that your guests will get your dress dirty. After all the preparation you put into the big day, the reception is your time to truly rejoice in your newfound life with your partner. But you should still be mindful of your surroundings. Spills can happen easily, from people dancing with cocktails in their hands, to countless tables with food and cake. You’re bound to get a little dirty at your reception. As a magnet for a potential mess you should be armed with materials that can actually help you in case a stain does occur. That’s why we suggest that you bring a stain remover with you. Whether they are wipes or a spray bottle, make sure to have a stain remover on hand. You’ll be grateful you did when you spill a little bit. Baby wipes are actually a great way to remove stains (as long as they are dye and perfume free). However be aware of the material of your gown (which is probably made out of a polyester blend since most gowns are). If you’re wearing a dress made out of silk and linen, baby wipes could leave a water spot. Of course, if all else fails you can drop your wedding dress off at Pico Cleaners, conveniently located at 9150 West Pico Blvd. 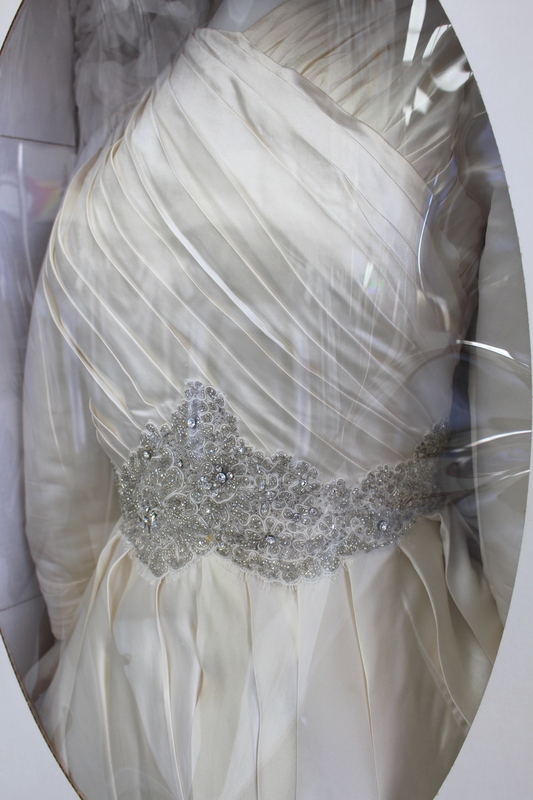 We make sure that your wedding dress can be cleaned properly. We want your dress to be preserved for generations and that can start easily by dropping it off to be dry cleaned! Our friendly dry cleaning experts know how to handle delicate materials like batiste, satin, damask, chiffon, taffeta, and more! And since you’ll probably be heading out to your honeymoon the next day, you or a loved one can drop the dress off to be cleaned and ready for you to pick it up when you return. Call us today for any questions you have 310-274-2431.